In the earlier pAsuram, AzhwAr mentioned that with a huge form, he carried out a small task (of begging King mahAbali). 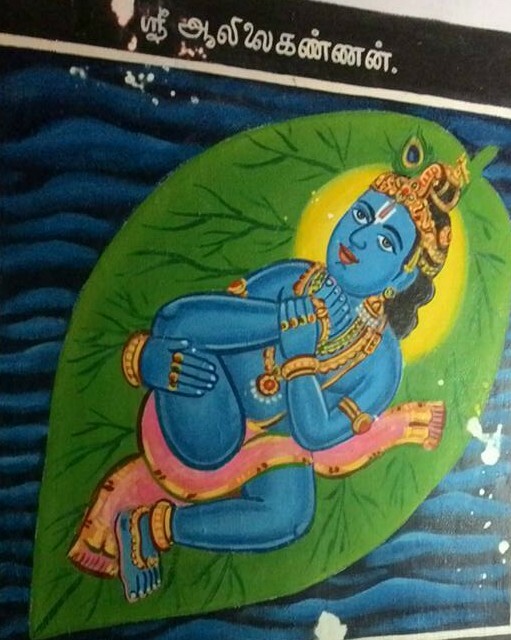 In this pAsuram, he talks about carrying out a huge task (swallowing the entire world) with a small form [he lay down as a child on the leaf of a banyan tree after swallowing all the worlds]. vizhungiyadhu meyyenbar – vEdham and rishis, who speak only truth, say that you had swallowed all the above mentioned entities like butter, to contain them in a small portion of your stomach. Normally when one recounts the five elements, in thamizh, the usage is maNNum punalum (earth, water etc). Why did AzhwAr say earth, mountains etc? When he swallowed all the entities, he did not swallow them in any order! That he swallowed these was true is claimed by vEdhas and those who are highly knowledgeable in vEdhas (rishis or sages). alagu aLavu kaNda sIr AzhiyAykku – alagu refers to the instrument used for measuring. It has several units of measurement such as lakhs, crores, Sankam, mahASankam, padhmam, kumudham etc. The count of auspicious qualities that you have is so huge that these units cannot measure them. He has auspicious qualities and weapons such as the divine disc. It is said “mathikshayAnnivarthathE na gOvindha guNakshayAth” (I am unable to about the qualities of gOvindha, not because of any shortcoming of his qualities but due to shortcoming of my knowledge). anRu ivvulagaLavum uNdO un vAy – on that day when you swallowed all the worlds to keep them safely in your divine stomach, was your divine mouth bigger than these worlds to enable you to swallow them? AzhwAr hints here that with a small mouth, he was able to swallow such large dimensional worlds, thus exhibiting his wondrous activity. We shall move on to the 11th pAsuram. This entry was posted in Other on June 19, 2017 by T N Krishnan.